When I was nine and ten-years old, nothing was cooler than Digimon. Sure, Pokemon had the great games, and was overall the better franchise. But when it came to TV shows, Digimon was untouchable. Despite its often-lacking production values, it had surprisingly strong storytelling, relatable characters (Izzy was one of my childhood heroes), and awesome monsters that ranged from dinosaurs to robots to vampires. Sure, as I’ve grown older it’s easier to see the cheesy moments and how ridiculous it often could be, but its stories and characters still hold up pretty well. Digimon has had a few movies released in Japan, though up until now, only one Digimon movie has made it to the western world, and it wasn’t actually a movie. 2000’s Digimon: The Movie was in actuality three Digimon short films spliced together. Though it was well-animated (each short was directed my Mamoru Hosoda, who has since created some of the better anime films in recent years), the fact that it consisted of three largely unrelated shorts sewn together with a shaky attempt at connecting their narratives meant the whole thing was a bit incoherent. Not to mention the additions of popular-at-the-time songs felt out of place and have made it feel dated (nothing says “this movie was released between 1999 and 2002” like Smash Mouth’s All Star). Though the Digimon franchise has seen a few different television series since then (each with their own continuities and casts of characters), it’s the first two that are still seen as its heyday (the third “season” even bored me away). 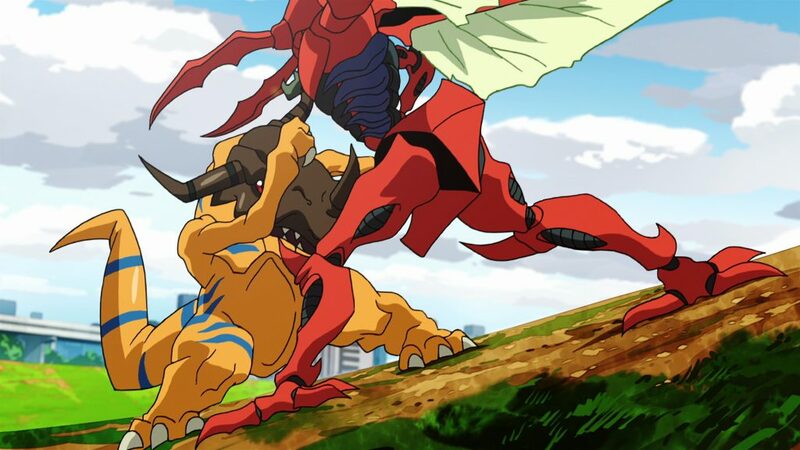 The first two Digimon series, known as Digimon Adventure and Digimon Adventure 02 in Japan, were the only iterations that shared characters and continuity with each other, and hold the most nostalgic value for longtime fans. It’s something of a no-brainer then, that Digimon’s most recent iteration is a series of six planned feature films that bring back the cast from the very first Digimon Adventure. 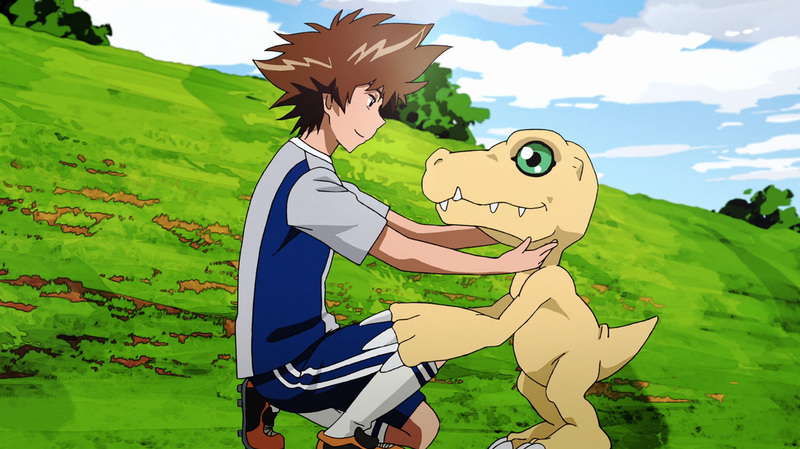 The first of which, Digimon Adventure Tri. Chapter 1: Reunion has been released stateside in an episodic streaming format in its original Japanese version for a few months now. But an English dubbed version – which brings back much of the voice cast of the original dubbed series – is seeing its way into special screenings in the feature film form it was always meant to be. With all that explanation out of the way, let’s get to the movie itself. Suffice to say, I fit squarely into the film’s target audience. 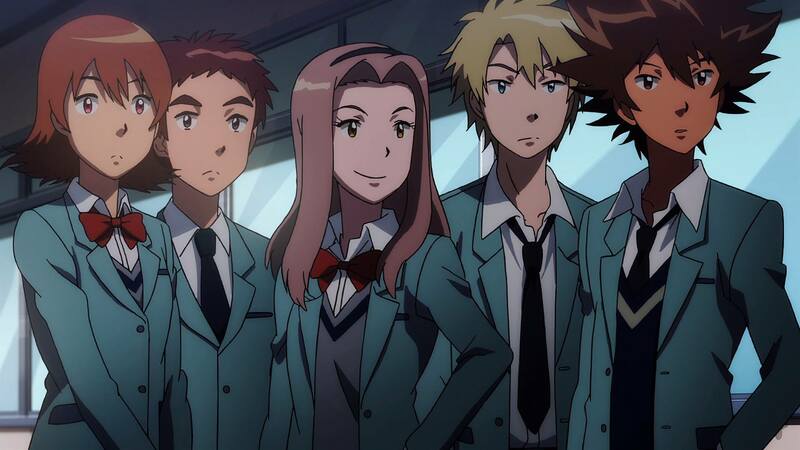 Not only does Digimon Tri bring back the original cast of characters, but it also fast forwards six years after the original series, when they’re all in high school (what is it with anime and high schools? ), so the characters have aged along with their audience (albeit not as much). This is a movie very much for the old school Digimon fans, which means just about any other audience would probably feel alienated (aside from perhaps children who would appreciate the animation and monsters on their own merits). The film ignores the epilogue from Digimon Adventure 02, which set a pretty definitive end to the classic Digimon continuity (I at first thought it completely ignored the events of the second series, until a trailer for a subsequent film after the movie revealed otherwise). 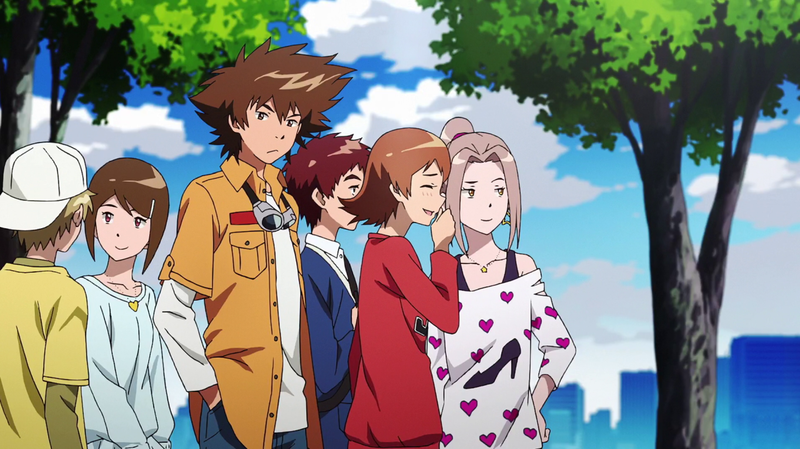 The story here being that Tai, Matt, Sora, Izzy, T.K., Kari, Joe, and Mimi – the “DigiDestined” who saved both the human world and Digital World from evil on numerous occasions – are still adjusting to normal lives in high school. But a connection to the Digital World is once again opening in the real world, unleashing powerful “infected” Digimon, who begin wreaking havoc. It may not sound like too much of a plot, but again, this is the first in a six-part series, so much of the bigger story and finer details are yet to be revealed. On the plus side, the fact that there’s only so much of a Digimon-centered plot means that the movie actually gets a good deal of development in for the main characters. The DigiDestined have all gone their separate ways, but keep in touch from time to time. Tai has a big soccer game coming up, and sees it as an opportunity to get all of his old friends together again. The entire first act of the film more or less just deals with each character’s everyday life, with Tai in constant disappointment at his failure to get them all together. It seems kind of silly, but it works for nostalgic purposes for its target audience. And each character is given a fair bit of attention, which is twice as commendable given how many of them there are (we even get a new character named Meiko, though she admittedly gets less screen time than the rest). Plus, I kind of enjoyed the rather low-key pace that much of the film had. It gives audiences a chance to be reintroduced to the characters and let them know where they’ve been since we last saw them in an effective way. As you might expect, the DigiDestined do eventually band together when evil Digimon start invading, and their faithful Digimon partners all return to help them battle the evildoers. The film even toys with the heroes’ new outlook on the battles they wage now that they’re a little more mature (as kids they see their dinosaur friend fighting a giant insect and just wants their buddy to be victorious, but now that they’re older they worry about the collateral damage they may cause, and the people they might hurt). Though I admit I could have done without the bromantic rivalry between Tai and Matt being reignited, and a sub-plot involving the good Digimon being vilified by the media feels a bit underdeveloped. Perhaps the film’s best aspect is how successfully it hits all the right nostalgic notes. Even with the slower pace early on, it feels like a Digimon movie. As stated, Digimon Adventure Tri does a really good job at re-establishing the characters, and the battles between Digimon are quite satisfying. Having much (though sadly not all) of the original English voice cast is the cherry on top, with the audience that accompanied my screening erupting with applause every time one of the returning voices was heard. The film even features the iconic photograph the characters took at the end of the first series (though it is obscured by lighting, giving us a good tease). The film is also pretty well animated. It’s certainly a good number of huge steps up from the quality of the original TV shows, with the animation here being appropriately fluid for a theatrical feature (though some background characters unfortunately seem to be suffering from Hannah-Barbara-ism, as they appear to be frozen in space and time). The backgrounds are often quite detailed and even beautiful to look at. The musical score also had some highlights, especially a magnificently cheesy new theme song that rivals what the original TV shows had to offer. When all is said and done, one’s opinion of Digimon Adventure Tri. Chapter 1: Reunion will largely depend on your history with the show itself. It has good characters, and good development for them, but the plot – which mostly serves as an introduction to the five films to come – and the emphasis on nostalgia probably won’t resonate with anyone who isn’t familiar with the original shows. So as a standalone movie it may not be too effective. But as an introduction to a new series featuring classic characters, and for those who grew up watching Digimon, it certainly does what it set out to do. All I know is, even with its flaws, my nine-year old self was doing backflips through the whole thing. Excellent review! I first saw Digimon Adventure tri. a while back on Crunchyroll. I saw both available parts (eagerly awaiting part 3 really soon! ), so I wasn’t spoiled by the horrible post-credits scene. That said, I had an amazing time watching the dub on the big screen. Like you, I grew up with the dubbed characters and voices. Some voices are different, but they somehow got Joshua Seth back, and that’s what matters. 😉 Hearing each voice made me so happy, and the whole theater got excited each time a new voice spoke, especially Agumon’s “HEY TAI” and Tentomon’s anything. I’m very pleased they kept the tone of the original movie instead of inserting pun after pun, especially given how much more serious tri. is. They did a great job making the cast sound older and more mature, while being as faithful to the original plot as possible. The story is great, and I actually love how low-key it is. I just want to see the characters being people, and that’s what they did. They went shopping, on a Ferris Wheel, chilled at home, hung out at school. I enjoy that, especially since we’ve already been through the big adventure part. I do love the animation of this film though. It’s a huge step up from the old series and pretty much anything Toei Animation is doing currently. The few battles were amazing, and hearing Brave Heart delighted me. (Don’t get me started on whatever the heck they were playing in the opening though…) That last battle is a sight to see, for sure. I hope they dub the second movie and onward. The second movie is good too, but I won’t spoil anything (beyond what Crunchyroll already spoiled about it for unsuspecting theatergoers). I’m so glad the series is back and appeals to older nostalgic Digimon fans! PRODIGIOUS! I really enjoyed the movie and hope the others get similar treatment (I can’t bring myself to watch a movie broken down into episodes). It really took me back. Mona Marshall is amazing. Nobody else can do Izzy. That “Prodigious” was cheer-worthy. Did you know that she’s 69-years-old? I have a huge desire to sit down and watch the original Digimon series. I always thought it was so compelling and moving as a kid whenever I caught an episode, but could just never seem to catch it on TV regularly. Knowing now that there’s a big followup to the original series/movies on its way, I’m definitely going to try a little harder to track those episodes down! Tell me: is the cheese level in the TV series so horrible that it would taint my happy memories of the show? I just feel like I’ve missed out on something very important. Having watched through the first season of Digimon again a few years ago, I can say that the show does hold up well (with the exception of some notable animation goofs here and there. Again, limited production values). The cheesy qualities really only apply to the music and the jokes added to the dub (though I find them to be on the “so cheesy it’s gold” side of things). I definitely recommend tracking it down. I’m on it! Thank you! This is one instance where I outright indulged in the nostalgia. My nine-year old self was quite proud. It had a great cast of characters to be sure, even the companion Digimon themselves were memorable. I can’t think of a single main character I didn’t like, though I’m not the biggest fan of Matt, if only because he’s considered the second main character despite that Izzy (my favorite character) got way more screen time and was honestly far more important and useful story-wise. *Ahem! * Anyway, Glad to find another Digimon fan. The movies definitely feel like they were made for those who grew up with the original series, as taking nostalgia aside and seeing the original crew back in action again, the movie is nothing particularly special. I’d say the heyday of the series was up to Tamers as that was the point where I still saw products of the series being largely marketed outside of Japan, people just sort of lost interest after that, at least I definitely didn’t see as many toys, games and whatnot of the series. I remember finding the concept of the tamers themselves being the digimos particularly stupid at least. I never found either the 2nd or 3rd Digimon series to be on par with the original, but that concept alone was enough for me to not be interested anymore in it.